I have to admit that I was more than a little ooged out by the mayonnaise-based marinade used in The Grillin’ Fools’ Ultimate Guide to Grilled Chicken. Raw chicken soaking in a slimy mayo bath – yech. However, their results did look mighty tasty, and I have been looking for something new to do with chicken. So here goes…. Wearing food-safe gloves (cuts way down on the gross factor), combine the mayo and the rub. Slather both sides of the thighs with the marinade and toss into a zip-top bag. Cover with any remaining marinade and toss to coat. Squeeze the air out of the bag, seal it up, and stash in the fridge for at least 4 hours (overnight is even better). Turn the bag every so often to make sure all the pieces get a coated in the marinade. Just before you are ready to fire up the grill, remove the thighs from the marinade and give them a dash of rub on each side. Arrange them on a rack set over a pan (I used a 9×13 baking rack) and return to the fridge uncovered. This will help remove any excess moisture and crisp up the skin. Set your grill up for an indirect cook at medium (350°F) heat. I used a plate setter on the Big Green Egg to give me nice diffused heat and prevent flare ups. 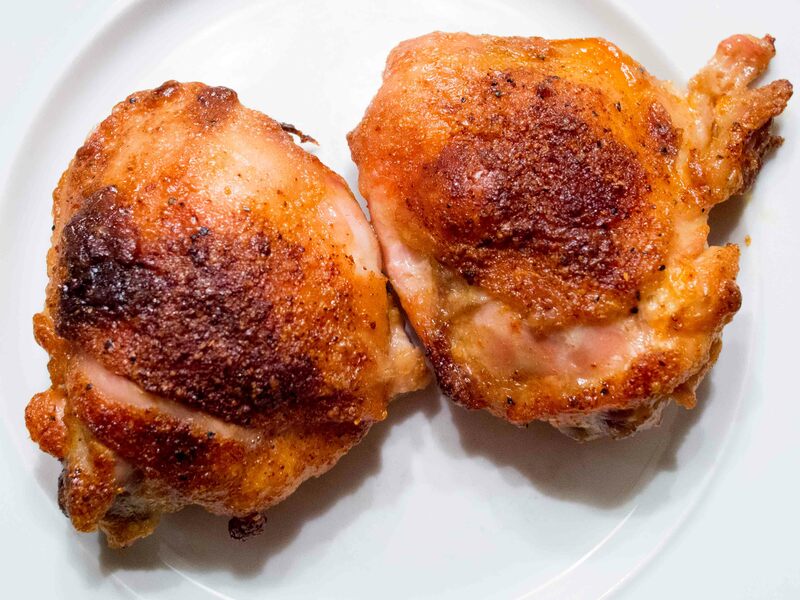 It’s pretty amazing just how juicy these thighs cooked up. It was almost like they had been braised, but the skin was still nice and crispy. The flavor of the rub came though nicely, but any mayo taste had completely melted away. They were some of the best thighs I think I’ve ever made – well worth the slime.